Tree trimming is our primary line of business. 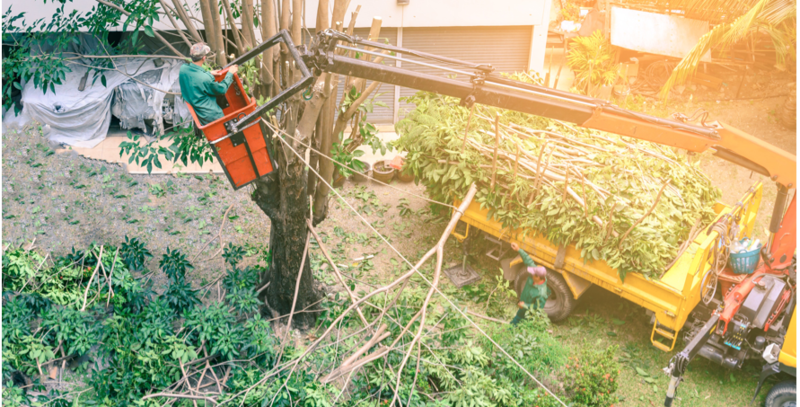 In many ways, having a regular tree trimming service can prevent tree trouble, including emergency tree removal! This is because a healthy, well-maintained tree is less likely to die or fall. It also requires less trimming. Our crews are comprised of professionals, which have extensive experience in this type of work. We are professionally dressed and, most importantly trained in caring for your trees and plants. We will also be there to walk your property at the end of the job to make sure everything was done perfectly and your yard is left clean, often cleaner than when we arrived. To be on time. When we set an appointment to trim your trees, we will be there and ready-to-work or you will be notified in advance! To give you the competitive prices. We provide a high value for the work you will receive. To do a professional job. We are tree trimmers and pruners, not butchers. No lion-tailing or tree topping! To leave no (well almost no) leaves. When we are done with trimming your trees, we will leave your property free of tree debris unless otherwise specified in our agreement. Crown cleaning: removing dead, diseased, or decaying branches. This can reduce fire hazard, improve the tree’s health, and instantly beautify. Structural pruning: this is recommended for young trees only. Like the name implies, it is done to strengthen the trunk and main branches of a tree so that it will grow into a beautiful mature tree. Crown raising: when a tree’s branches get too low and encroach on your yard or get near a building, it’s important to carefully remove them without hurting the tree. What tree trimming service would you like? Call today for a free estimate (469) 706-9832!